Going to start this post off with a little bit of a rant so bear with me:) After seeing the options for September, I wasn't super excited about Birchbox. I didn't want to be spending $10 on items I didn't think I'd ever use. So I contacted Birchbox about canceling. I prepay for a year every spring (I ask for it as a birthday gift) and their policy states that you can only cancel within the first month of your yearly subscription. While I understand that is what their policy states, throughout the summer, there have been many people on Youtube, blogs, and in comment sections of posts saying that Birchbox let them cancel anyways and credited them for the remaining months. Well, perhaps they had enough of that or were getting annoyed...I'm not sure. But they won't let me cancel. I'm a little unsure why some people were allowed to cancel in the middle of their paid year and I was not. But it certainly didn't win Birchbox any points with me. Apparently I will finish out the year though so you'll continue to see these points for awhile. Now onto what came in my September box. As I said above, I wasn't super excited about any of the sample choices or the curated box. So I didn't choose a sample at all and figured I would just be surprised with what arrived. The theme this month was multitaskers. Bioderma Sebium H2O - $16.90 - I was super excited about this until I saw the itty bitty sample size. I love Derma E products and I have friends who love the Elizabeth Mott mascara so I'm looking forward to those two products. I'm kind of meh on the other ones but I'll let you know next month. Living Proof no frizz nourishing oil - I have been using this on my wet hair, especially when I am letting it air dry and it works well to combat my frizz. 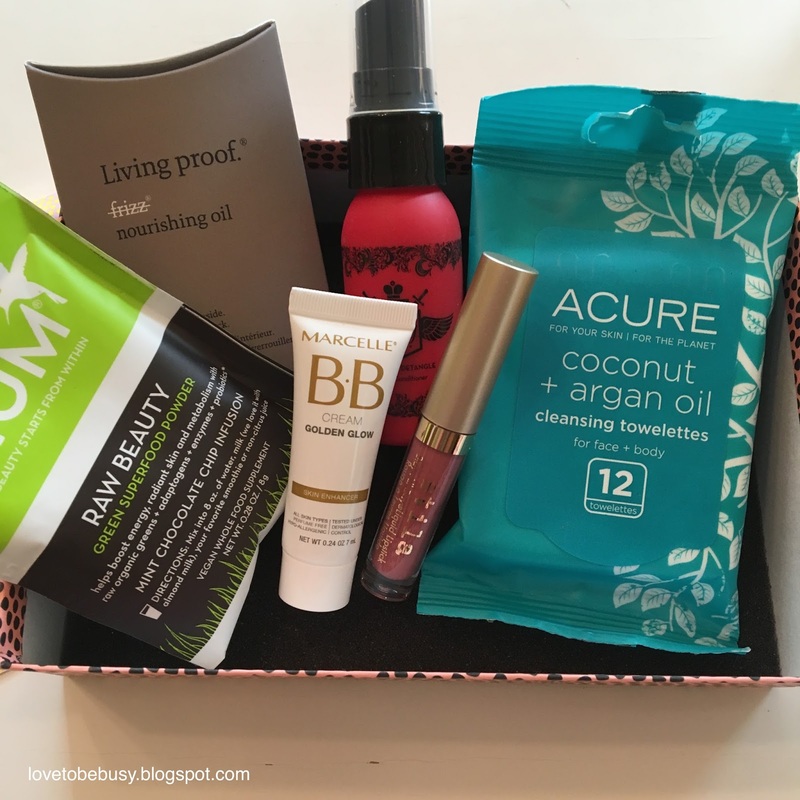 Beauty Protector protect and detangle - I didn't use this during the past month however I have had quite a few samples in the past from Birchbox and I know I like it. It works well to protect my hair when I blow-dry and it smells wonderful. Stila Stay All Day liquid lipstick in Patina - This shade is a little darker and more brown than it looks in the tube. However, the formula is nice and not super dry. I'd like to try other shades. Marcelle BB Cream Golden Glow - This matched me for about 2 days after being in the sun. It is way too dark for every day foundation for me and if you want to use it to make your face appear more tan, it isn't very natural. I have been mixing it with my very fair It Cosmetics CC cream just to finish up the little tube. Acure Organics coconut and organ oil cleansing towelettes - These didn't smell very good and they were super dry. They removed absolutely nothing from my face. I ended up using them to wipe foundation off my hand when I mixed shades. Hum Nutrition powder - I don't even know where this went:) So I didn't try it. Overall, the box wasn't as great as I had thought when I chose the curated box. I do love the Beauty Protector Spray and I'm liking the Living Proof oil as well. I love the formula of the Stila liquid lipstick and it will be a good fall shade.